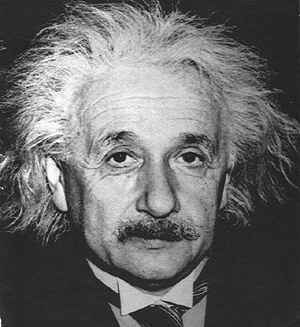 The original image was calculated in a numerical simulation by S. Wolf. The model image (SWOLF.MODEL) is 256 x 256 in size. It represents a protoplanetary disk as simulated by Wolf and D'Angelo 2005. It simulates a M_planet = 1 M_jup around a star of M_star = 0.5 Msun at a Distance = 50pc. A FITS model image optimized for CASA use is available. [File:Cluster2.gif|300px] Model protostellar cluster, provided by K. Tatematsu. 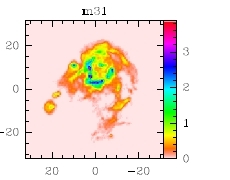 The model image (cluster.fits) has been used in previous ALMA simulations. 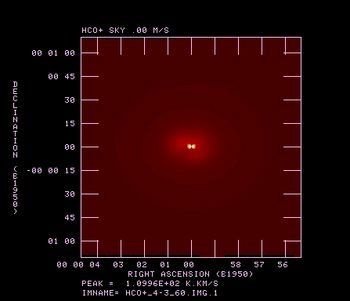 This is a continuum subtracted H alpha image of the nearby galaxy M51 (NGC 5194 -- provided by D. Thilker at NRAO). 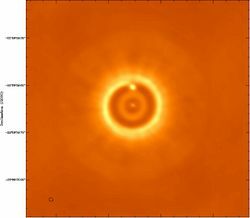 This H alpha image should be a reasonable representation of the atomic FIR lines and other tracers of massive star formation, and it may be reasonable model for other molecular transitions as well. Shown in logarithmic stretch. Image dynamic range is over 10000. The model image (M51HA.MODEL) is 512 x 512 pixels in size. Large negative pixels resulting from subtraction of saturated stars have been blanked with 0's. 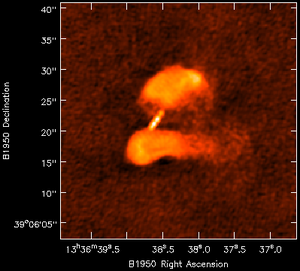 This HII region in M31 displays complex extended structure. A small model FITS image (M31_128.FITS) is available. It was 1024 x 1024 pixels in size and had a pixel scale of 0.01 arcsecond for the 3 km array simulation. This is a model of the HCO+ 4-3 line emission in a protostellar envelope provided by M. Hogerheijde. The model is viewed at inclination 60 degrees. 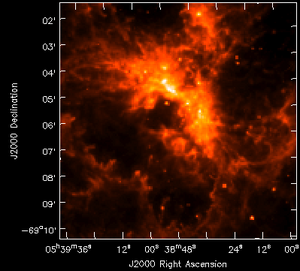 The model image (HCO+_4-3_60.FITS) is 560 x 560 pixels in size. Obvious image boundary structures are also included, but we will treat it like any other structure in the image. 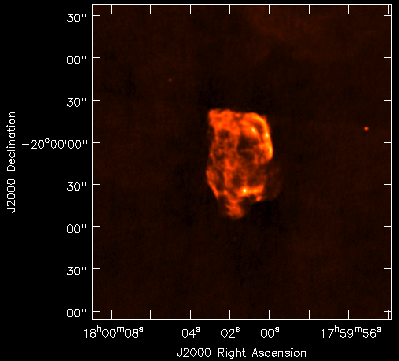 3c288 radio galaxy 3c288.fits - imaging the bright jet and the large lobes can be nontrivial. This page was last modified on 7 November 2012, at 14:44.